One of the basic skills any beginner student of any activity is the ability to recognize if something is not done the right way. Be it the ability to notice spelling mistakes in written texts, the know how to acknowledge that a ski jumper’s form during the jump is not the best or in our case the deep understanding of the ever complex swimming stroke to recognize many times plentiful mistakes in swimmer’s stroke. The recognition of miscellaneous stroke flaws is only the beginning stretch of an efficient swimming style, yet very very important one. After spotting issues is a breeze, the next step in the swimming education is to figure out how to improve those issues. 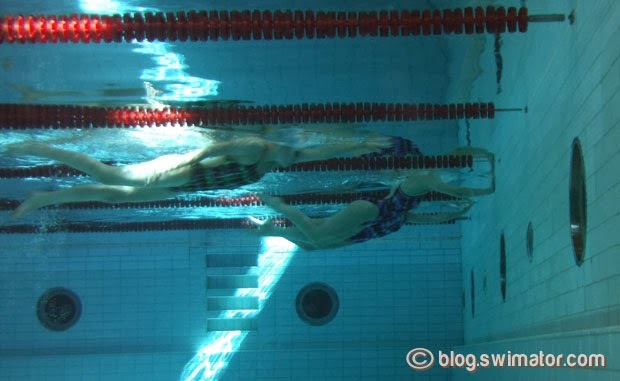 Some are easy to fix with common swimming drills, others require a bit more thinking outside the box to help the individual overcome the issue. What they all require though is patience and dedication from the swimmer to repeat the "correct" movements over and over until mastered. 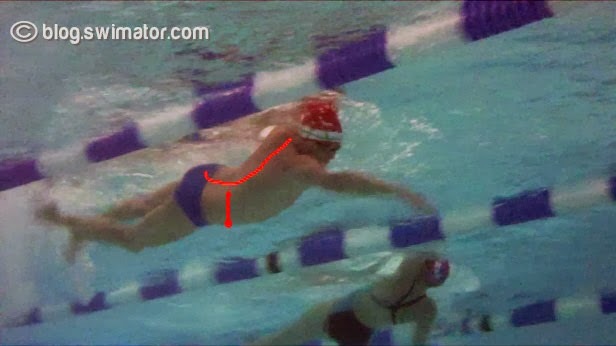 Below you will find a short freestyle swimming video which includes four identified problems with the swimmer’s stroke. These are the biggest problems in the video preventing the swimmer to get to the next level of his swimming success. They are all easily fixed with a persistent and patient training, bringing great speed improvements to you as a swimmer or triathlete. So, please watch the video below and then scroll down for more detailed discussion of the spotted mistakes. 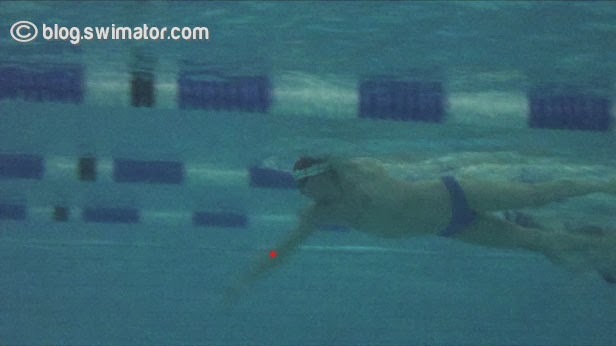 If we look at the swimmer’s outline from the front, knowing that the body should be as small as possible, the image is suddenly disturbed with a very deep kick which protrudes behind the swimmer causing unnecessary resistance to the forward motion. As you have guessed it, the idea here is that the kick should be small and shallow and the swimmer should not rely on it for balance. To start with, an awareness of the kick needs to be brought to the attention of the swimmer during the swim. We can try using the analogy of rubbing the toes over each other or putting fins on. Then of course, doing a lot of balance drills like kicking on a side or floating at the surface will help with less reliance on the large kick for balance. The knee driven kick is a bit tougher to fix as to this day, there is no tool which could simply put the legs in the right position. Make sure the kick comes out of the hip with the knee only ever slightly bending while it gives into the pressure of the water. Keeping your hands pointing in the direction where you want to go, therefore, keeping them inline with your body when up in front is a must. In this case, the swimmer has a problem with one arm deviating from the long axis, especially when breathing. Remember, your body should roll as one, like a tree log. It comes down to awareness again and the ability to roll your body without stiffening the shoulders. To work on the body-shoulder separation, you can for example try the following drill. While flutter kicking without a kickboard, keep your arms extended below the surface of the water and when your head comes up for a breath, do not move your arms up or down, just use your body to lift your head up, but not your arms. When you master this, you are in a good shape. Another drill you can do is to kick on a side with your bottom arm extended forward and take frequent breaths while keeping your front leading arm stationary, again, not helping you with the breath. The front catch is an advanced skill which takes some understanding to master. 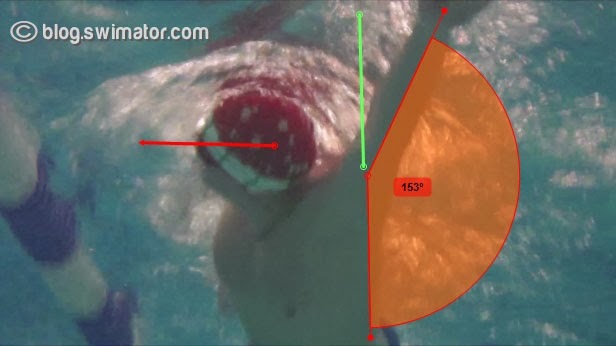 The swimmer on the video has some signs of an initial catch phase, but then is not able to hold the catch throughout the stroke, therefore, propel himself forward with the forearm like a paddle. My suggestion here is to do a lot of one arm swimming while maintaining a very slow speed and arm motion, so you can concentrate on feeling the forearm catch. Get immersed in the motion and slow down as much as you can. Use fins, if the kick is too tiring, so you can have a good horizontal position and most importantly, spend the same amount of time on each side of your body while you do this. Many swimmers tend to just gallop in their stroke when doing a one arm drill and that defeats the purpose. So as you see, we are again at the balancing discussion. The ability to swim from side to side comfortably without using arms/legs as your supports is the key building stone for successful swimming. Without mastering this skill, you will always swim up the hill. Most beginner triathletes and swimmers struggle with the concept of having their bodies in a horizontal parallel alignment with the surface of the water. This causes them to swim a bit uphill with inflated chests high up and tired legs down. In this swimmer on the video, this issue is quite visible during the breath, when the lower back just falls down below the surface. There are two ways, which are really interconnected, to improve this. One is to keep the eyes focused on the bottom of the pool, keeping the neck nice and flat without wrinkles, thus putting more pressure on the chest which will help with the leg lift. However, this alone will not suffice. You will need to learn the ability to push your flat lower back closer to the surface which actually is the biggest trick to raising one's legs. There is one more issue which can cause swimmer’s or triathlete’s legs to sink and that is the flexibility of ankles. If the ankle angle is less than 180 degrees (meaning that if you cannot point your toes, so the top of your foot is flat in the ankle area), then there is a slight resistance. Your feet are like the flaps on the wings of an airplane. If they are horizontal, plane flies nicely, if they go down, plane is landing and is pushed to the ground. If your misalignment happens during the breathing cycle, then the problem is not really in your lower back, but in the way you rotate your body. Which brings us again, yes you guessed it, to the balancing drills on sides. :). Master the hip rotation and balance with a nice straight spine and you are 80% there. The rest is just finetuning. I hope you learned something useful in the analysis and have some material to work on in your swim routines. Keep in mind that everyone is unique and we all need different stimuli to help us achieve our goals, but there are basic principles that need to be mastered to get off the ground. In swimming, one of the key principles is the ability to balance your body alone without your legs and arms.